Each flower has a circle center and a double row of 12 petals. Write the primary factor in the circle. So if you are working on the 3s table, write 3 in the center. On the smaller, inner petal, write the secondary factors (each number from 1–12). On the larger, outer petal, write the product of the center number and the inner petal number. 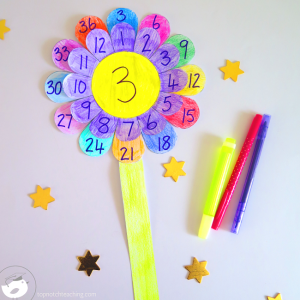 You can create separate flowers for each number. Display them in your classroom as your multiplication garden or a multiplication bouquet.